Request a trial unit today! 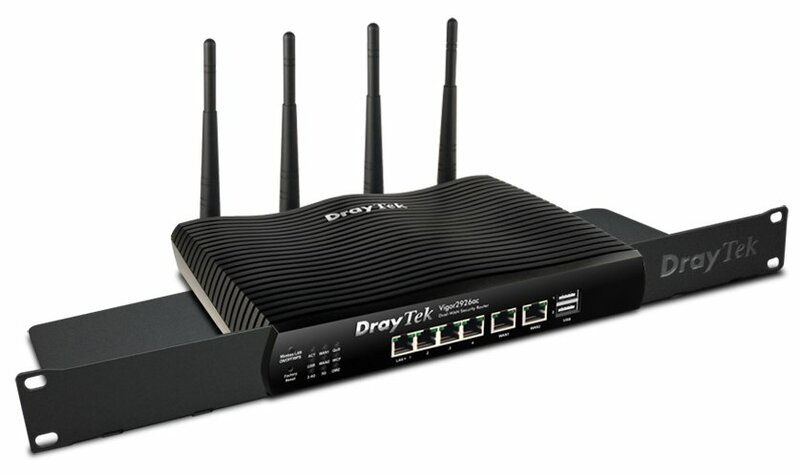 I want to test drive a DrayTek Router. Vigor2926 Series is a Dual WANs broadband security firewall router. Vigor2926 Series provides reliable broadband connectivity with the multi-WAN accesses. The two Gigabit Ethernet WAN ports can be operated in failover or load balancing mode to ensure a steady Internet connection. The two USB ports can work with 3G/4G/LTE USB modem to add additional wireless Internet access. Vigor2926 Series also covers comprehensive functions, including VLAN, Bandwidth Management, Quality of Service, DNS Control, SPI Firewall, Web Content Filtering, and Central Management solutions to provide a reliable and secure business network. Vigor2926 Series has two Gigabit Ethernet WAN ports that can be used for any types of connection, 3G/4G/LTE USB modem can also be attached to the USB ports of the router, and offer wireless Internet connectivity in case the fixed lines are not available. All of the WAN interfaces can be configured to be operated in either Load Balancing mode, which will be active all the time, or in Failover mode, which will be active only when detecting connection loss or heavy load on the primary connection. On Vigor2926 Series, Load Balancing can be either IP-based mode, which will distribute the packets destined to different IP address across different WANs, or Session-based mode, which allows the packets of different sessions to take different paths, which means a multiple-session connection can be established across multiple WANs, and use multiple WAN's bandwidth at the same time. Policy-based Load Balancing is also supported so that you may specify the path for some certain packets. To increase network accessibility, Vigor2926 Series also supports High Availability feature and allows one or more redundant Vigor2926 Series to be added to the network and operated in standby mode. The 4-port Gigabit Ethernet switch on the LAN side provides high-speed connectivity for the servers and PCs on the local network, and the Virtual LAN (VLAN) feature allows you to separate the LAN clients into different logical domains thus to increase the security and network efficiency. Vigor2926 Series support 802.1Q standard and can build a Tag-based VLAN system with an 802.1Q-support switch, Port-based VLAN is also supported that each LAN port can be configured as a member of different VLAN and be isolated from each other without the use of VLAN tag. Vigor2926 Series supports Stateful Packet Inspection (SPI) Firewall and flexible filtering rules, it can accept or deny packets based on the information in the packet header (such as source IP, destination IP, protocol, and port number) or the packet's application. IP-based restrictions can be set to filter certain HTTP traffic as well as various application software and help you to prevent time and network resource wasting on inappropriate network activities. With an annual subscription to Cyren Web Content Filtering service, you may also filter the websites by their categories, and set up restrictions to block the whole categories of websites (such as Social Networking, Gambling.. etc.) without the need to specify every site you would like to block. The Cyren service is constantly updating the categorization, and a free 30-day trial is included in each new router. The Vigor2926 Series firewall also includes DoS (Denial of Service) Defense to protect the network against variants of attacks. Vigor2926 Series supports both LAN-to-LAN VPN and Remote Dial-in VPN, up to 50 VPN tunnels can be set up simultaneously. All the industry standard tunneling protocols are supported, including PPTP, L2TP, IPsec, and GRE, and it's compatible with 3rd party VPN devices. Vigor2926 Series also support SSL VPN - a type of VPN based on the very common encryption method which is used by all the HTTPS websites. While the traditional VPN protocols might be filtered by the firewall and NAT of public networks, SSL VPN will be passed as long as the HTTPS is allowed. DrayTek also offers free official client App for Windows, iOS, and Android. VPN Trunking is also supported by Vigor2926 Series, this allows you to establish two VPN tunnels to the same remote site but through different WAN interfaces. The two trunking tunnels can be set up in load balancing or failover mode. Vigor2926 Series can be the central management portal for all the Vigor devices on the same network, including VigorAPs and VigorSwitches, which allows the administrator to manage all the devices through a single portal. Vigor2926 Series also embeds CVM (Central VPN Management), an easier way for Network administrator to establish and manage VPN connections between several CPEs (VPN Client). The router itself supports TR-069 protocol and can be remotely managed and monitored through the TR-069-based VigorACS system, thus to reduce the need for on-site technicians.